I can’t tell you why this appeals to me so much. Perhaps it’s because I’ve got a bare kitchen wall in need of accouterment and a $30 gadget is always right up my alley. And, beyond my own interest, this seems like a great holiday gift idea for our parental in-laws (only one of whom reads the blog, hi Mom). 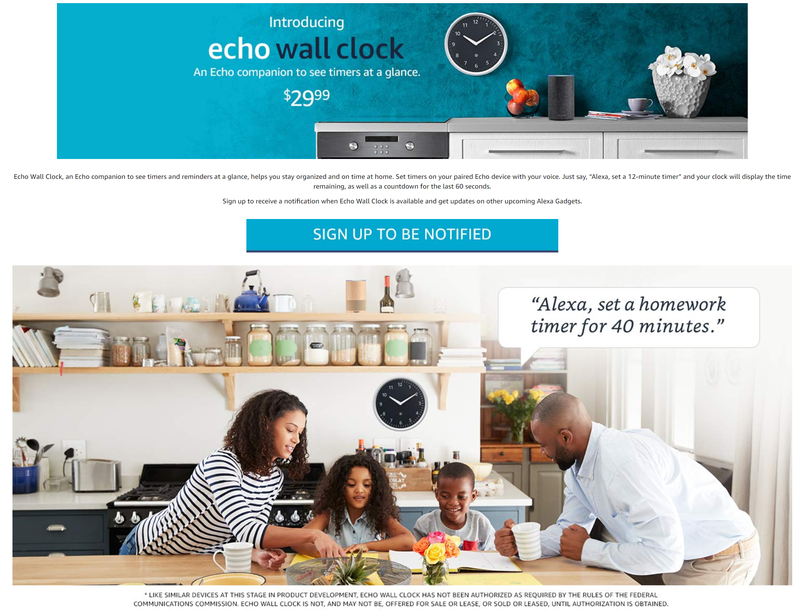 Echo Wall Clock, an Echo companion to see timers and reminders at a glance, helps you stay organized and on time at home. Set timers on your paired Echo device with your voice. Just say, “Alexa, set a 12-minute timer” and your clock will display the time remaining, as well as a countdown for the last 60 seconds. 2) Clock requires two AA batteries. Wonder how long they’ll last. This was probably one of the most useful things they announced, to me anyway. We use those timers all the time, and I always find it a little annoying to have to open my phone or ask it to see how much time is left. This sounds like a great solution.